Adult Vacations in the Caribbean.. Which hotels are perfect for your Adult Vacations? Adult Vacations await you at the Riviera Maya's All Inclusive Resorts in beautiful Mexico. Are you on your honeymoon, romantic getaway, beach trip with friends or just a fun vacation away from it all? All Inclusive Vacations that are adult only may be the best option for your next vacation. What are All Inclusive Resorts? These hotels include not just your rental rate for your room. It includes lots of things....sometimes it varies a little from resort to resort but I will help you see the differences of each resort. These Mexico all inclusive resorts include your meals(you can eat as much as you want). A la carte and buffet meals are at most all adult only all inclusive resorts. Most hotels will have places to get snacks during the day as well. (except for some rare wines that they may offer you at some of the restaurants within your beach resort). snorkel gear and kayaks for your romantic getaway. Most all inclusive resorts and hotels in the Riviera Maya offer tennis courts, billiards, ping pong, volleyball, boardgames, bikes to ride around the resort and lots more!! Picture this, You and your love out in the great big ocean together, kayaking or snorkeling. These activities are perfect for your romantic getaways! You will never be lacking in anything to do in the Riviera Maya! I personally love to shop and lay out by the pool for hours on end, but my husband would much rather be riding a catamaran or swimming in the ocean. Whatever you like, they have it!! Check out the beach that awaits you in the Riviera Maya! Isn't it georgous!!! So I know from experience that when looking for an inclusive vacation, you want certain things in a hotel, resort, beach and in all inclusive adult vacations. Different things are important to different people for their adult vacations and hotels. I want you to have all the information you need to be able to find which hotel or one of the many all inclusive resorts is perfect for you. There are many different types of all inclusive resorts, including hotels that focus more on spa vacations and some geared towards honeymoons and romantic vacations. My husband enjoys being outside and on our vacations he wants to be active. He doesn't enjoy much laying by the pool but wants to be experiencing the beauty around us whether it's swimming in a cenote, or walking through the jungle. In the Riviera Maya there are lots of natural lagoons and jungle settings because of the lush gardens in Mexico. The natural lagoons are filled with lots of little fish and beautiful coral creations in the Riviera Maya! When my husband and I were searching for all inclusive resorts and hotels for our honeymoon, I really wanted a hotel with lots of Mexican thatched roofs and winding pools so I could put my pool float in and float all over the resort for hours. I could not imagine romantic adult vacations without these two things, well and of course delicious food! Click here to read about The El Dorado Royale Resort because it is specially made for newlyweds and romantics. We really loved our honeymoon and we were really pleased with the resort. It is a 5 star resort and we could tell! The all inclusive resort El Dorado Royale is part of Karisma Hotels and they own several other high quality resorts for Adult Vacations. A benefit with choosing a hotel that has sister resorts is that you normally get certain privileges to be able to go to those resorts as well. It's kind of like getting 2 for 1. 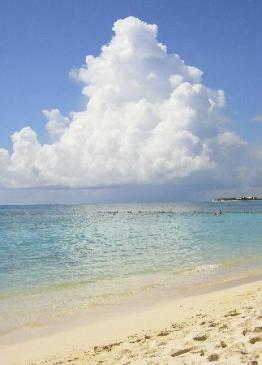 One of the most amazing things about the beautiful Riviera Maya is the Caribbean Sea!! It's turquoise waters and white sand are breathtaking! I can stand for hours just looking at the ocean with my feet settled in the soft powdery sand. Check out some of the beach photos I took. There truly isn't anything like the Caribbean Sea!! I love to relax while on our all inclusive vacations and one thing I love that is at most all inclusive adult only resorts are hammocks! Laying on a hammock and feeling the breeze from the Caribbean is so relaxing and rejuvinating! As I walked the premises of a sister resort of El Dorado Royale, I saw hammocks on every porch not to mention a special area of the resort that had lots of hammocks draped through palm trees and sugary sand. What a peaceful sight! A quiet, serene atmosphere awaits you here at El Dorado Seaside Suites. with pure white sands, and terraces with oversized jacuzzi's that face the ocean. You will be treated like a king, or queen at the Valentin Imperial Maya. This picture is taken sitting in a beach chair looking towards the ocean from the Valentin Imperial Maya Resort in the Riviera Maya. For romantic getaways and adult vacations, there is a new, private beach called Maroma Beach that is being newly developed and only has a few hotels and resorts on it. Before last year there were only one or two, and just last year 2 more were built on this georgous beach! Maroma Beach in the Riviera Maya was actually rated in the top 10 beaches in the world by Travel Magazine! Another sister resort in the Karisma Hotel family is El Dorado Maroma. This smaller boutique like all inclusive resort is perfect for you if you want a small, intimate feel to your resort. It's small enough you don't need a map but still you get the amenities as large all inclusive resorts. 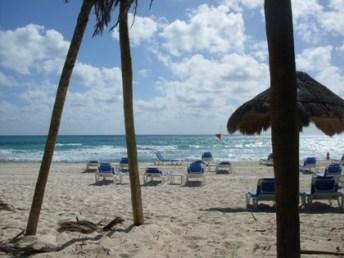 Another Adult Vacation resort also on Maroma Beach is the brand new Secrets Maroma Beach. This resort is Unlimited Luxury, with pure white sands, 500 acres of luxury and 12 pools! Secrets Maroma Beach has lots of swim up rooms. Swim up rooms are ground level and you have immediate access to a private pool that you share with the few other ground floor rooms in your building. That is luxury! It's like having your own private pool! As far as adult vacations go, Secrets Resorts also have a very good reputation for Mexico hotels! They are high quality, usually 4 and 5 star resorts. They offer impeccable service, quality and perfect romantic getaways! Some all inclusive resorts are decorating more modern and this appeals to lots of people. Adult vacations and romantic getaways have a special feel to them and the fabrics and decorations of your hotel can make or break your vacation. Chic modern fabrics and suspended beach beds encompass this brand new posh resort at Secrets Silversands. Is fitness while vacationing at the beach important to you when you go on vacation in the Riviera Maya? If so then the Excellence Riviera Cancun could be your choice for a beach resort. They have a fitness trail, 6 meandering pools and to relax afterwards, 5 outdoor jacuzzi's. Whether you want to run the trails, or relax by the pool or beach. Maybe your like my husband and I where you need both because different things are more important to you, then you should check out this resort. Do you desire complete luxury and want to be pampered? Elaborate staircases, and gardens make up this playacar beach resort, Iberostar Grand Paraiso. You won't be dissappointed with the service and luxury at this all inclusive resort that gets raving reviews from everyone who goes there! We just loved this all inclusive resort! Your right next door to it's sister properties which make it easy to use their premises as well. But you might not want to, because the Iberostar Grand will exceed all your expectations and the service will take your breath away! I'm a big fan of Secrets brand Resorts. These Secrets brand adult vacations all seem to be very consistent with their quality and even down to having the same restaurant names and spa names. Secrets Capri isn't brand new, but it does have a certain comfortable feel about this resort. It's quaint yet full of any and everything to do. Now, there is a brand of Resorts called Occidental that is created for adult vacations. They have a good name to them but there aren't many out there. They seem to have some unique features about their resorts that other all inclusives do not. One of my favorites is at the Royal Hideaway in the Riviera Maya it has a huge multi level sun deck that is oceanfront! It's stocked with beautiful rattan chaises and lounges and is perfect for sipping your Pina Colada while watching the waves crash. There is nothing better than relaxing and watching the beauty of the Caribbean Sea as it soothes you to sleep. Traveling with your family? Check out these resorts.